More than 70 students gathered last month to learn for a first-year student interprofessional orientation—the first of its kind for the University. Anastacia Flores, a graduate student in the nurse practitioner program in the School of Nursing, said she understands the need to connect and collaborate with other health professionals. She valued the opportunity to meet students from other programs. 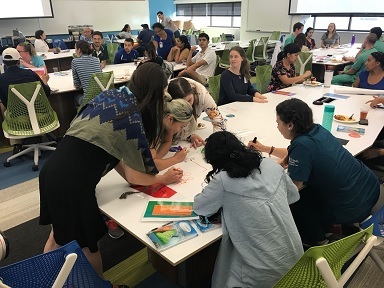 The program was held Aug. 30 and included students from UT Health San Antonio’s Schools of Health Professions, Long School of Medicine, Dentistry, Nursing, and Graduate Biomedical Sciences, as well as from the College of Pharmacy at the University of Texas at Austin. Students shared a meal, broke into teams to play a Pictionary-style game and listened to faculty from each of the schools present their respective professions’ scope of practice. The event was the first the University has organized specifically to orient new students to interprofessional education, said School of Nursing Assistant Professor/Clinical Lark Ford, Ph.D., MA, MSN, BSN. Ford said the program will be offered again at the beginning of the spring and possibly summer semesters.